Did you know that the United States buys more diamonds than the rest of the world’s countries combined? Yep. We buy over $25 billion worth of diamonds every year. The problem is that many diamonds are mined in war zones (like many African countries, where 2/3 of the world’s diamonds are produced). The money taken in from the sale of those diamonds goes to finance warfare by rebel factions (since often, it’s those factions that control the mines). And most of the time, workers have to endure terrible conditions, mistreatment, and even slavery. Millions of them do backbreaking labor for less than $1 per day. 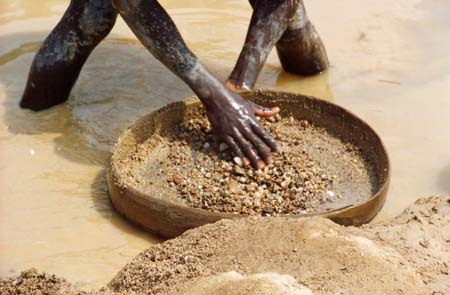 We can avoid contributing to war and misery simply by avoiding conflict diamonds (also called “blood diamonds”) and buying diamonds that are conflict-free. The good news is that thanks to the Kimberly Process, a U.N. backed initiative set forth in 2002, many of the world’s diamonds now come from conflict-free areas. But, not all do. So how can you make sure your diamonds are conflict-free? Some companies, like Brilliant Earth, source all their diamonds from Canada. This means that their diamonds are 100% conflict free. Brilliant Earth is by far the largest retail that carries conflict-free diamonds. Diamond sellers know people want to buy conflict-free diamonds. So they may say their diamonds are conflict-free, even when they’re not. Make sure your diamonds are not sourced from Liberia or Cote de Ivoire, in West Africa. Diamonds are circulation from these countries as “conflict free”, but this is a false label. It’s impossible for most jewelers to give you an honest assessment as to where their diamonds come from. Diamonds may change hands several times before they get here to the States. This is why buying Certified Canadian Diamonds might be your best option. Diamonds sourced from Canada are carefully tracked (at least they are with Brilliant Earth) so you can ensure they’re not originating from a conflicted area.